In recent years the bookshelves in the 'Popular Science' section of most bookshops have been filled with books about cosmology. Indeed, whenever our Society has a lecture about the subject you can almost guarantee that the talk will be well attended. In some ways this is not surprising as we all want to ask the important questions in life. Where do we come from? Are we alone? What will the universe evolve into? One person who could offer us a little enlightenment is a researcher from Oxford University, Dr Pedro Ferreira who specialises in cosmology. In the recent past, scientists such as Dr Ferreira would have had to rely solely on well-argued theories to explain why our universe looks as it does today. But in recent times a number of experiments and spacecraft have provided them with data with which to test the various theories. Most of these experiments measure various properties of the microwave radiation that started out on its journey across space-time when the universe was only several hundred thousand years old. This radiation, more commonly referred to as the CMB or Cosmic Microwave Background radiation, began life at this point in time as it took this long for the universe to cool to a point where atoms were able to form. Before this time the universe was opaque as there were no atoms only a plasma that absorbed any emitted radiation. Two experiments that Dr Ferreira was personally involved with were balloon-based packages that flew at high altitudes. BOOMERanG flew around Antarctica on two separate occasions. It was launched on this southern continent to take advantage of the high-altitude circular wind patterns that would carry it in a roughly circular path in around ten to fourteen days. By measuring the temperature fluctuations in the CMB the mission scientists concluded that the shape of the universe appears to be flat (rather than curved or saddle-shaped). The other experiment was called MAXIMA and it had a total of three launches from the National Scientific Ballooning Facility at Palestine in the US state of Texas. It backed up BOOMERanG's findings but at a much higher resolution. 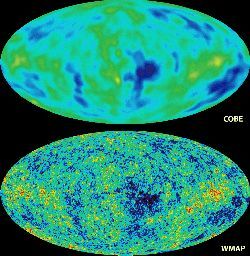 Both data sets showed that the scale of the temperature fluctuations in the CMB appeared to be on a scale of about one degree (the size of two full Moons). All this gives more credence to the Big Bang Theory and the period of rapid expansion that the universe underwent known as inflation. Following on from these missions was the NASA satellite called WMAP that really began to pin down some of the universe's vital statistics. By again studying the CMB it showed that our universe is 13.7 billion years old, the first stars were born 200 million years after the Big Bang, the CMB radiation is from a time 379,000 years after the Big Bang, and the rate that the universe is expanding is 71 km per second per megaparsec. In 2007 NASA plan to launch a satellite named Planck to improve upon these measurements and to start probing for answers to the next set of unanswered questions. What is dark matter made of? What is dark energy? It seems there's plenty of themes left for all those cosmology authors.